Received my WotF certificate today, and very handsome it looks, too. I’ll have to see if I can polish up and rescue the actual story in question — it features albino angel apes, so I can’t give up on it yet. 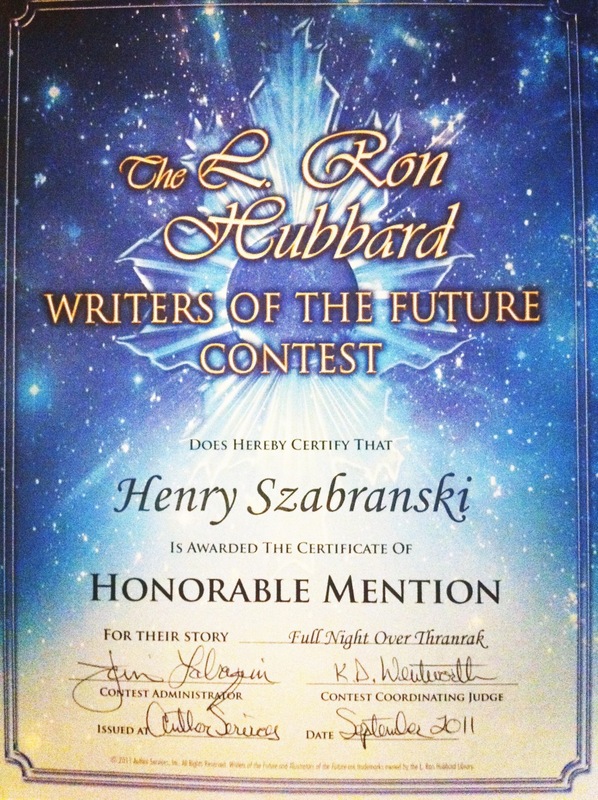 No update yet on when “Amy’s First” is to be scheduled at DSF (it could be any time in the next 11 months), but I have received notification my second entry to the Writers of the Future contest has been given an “Honorable Mention”. A few steps down from the Semi-Finalist position for the last entry, but it does show that wasn’t just a fluke (he says). The great feature about this contest is that entries are anonymous when judged, so reputation or past contest history count for nought. I hope this means my writing has achieved some level of consistency…something like beaten egg whites, I suspect.